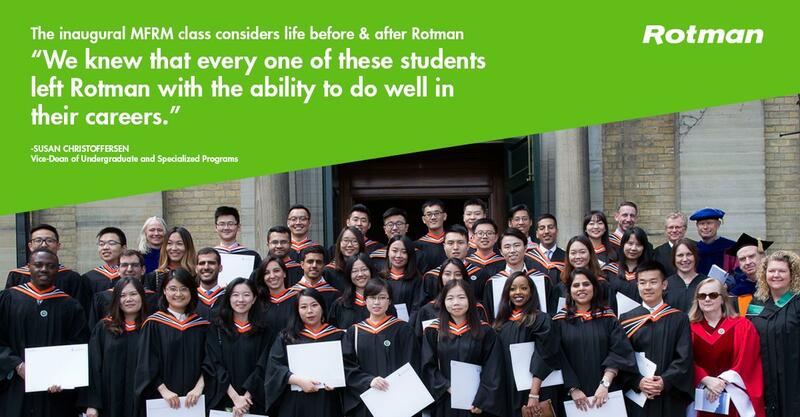 The Inaugural MFRM Class Considers Life Before and After Rotman - SchoolFinder.com! Earlier this September, Agnes Chang (MFRM ’17) returned to Rotman for a very important — but very rewarding — assignment. At this year’s Master of Financial Risk Management (MFRM) Welcome Reception, she and a few of her former classmates gathered to meet the new class and offer words of advice and encouragement for the eight-month journey ahead. It’s an experience that Chang knows well. Last year, she and her classmates completed challenging classes covering key concepts in financial risk — including market risk, credit risk, the regulations of financial institutions and derivative modeling — taught by global experts in finance. Along the way, the students tackled applied risk management projects, refined their communications skills, developed career plans and attended industry talks sponsored by the Global Risk Institute. “Students should know that it is an intense program, but they’ll learn a lot, make connections in the industry and have support from the School and the faculty,” says Chang, who now works as an investment associate with the Ontario Teachers’ Pension Plan. Today, months after finishing the program, Chang can still recall the excitement of starting the program and being a member of the inaugural MFRM class. “It was an unforgettable experience,” she adds. Pursuing careers and opportunities in risk management. The MFRM Class of 2017 was, and continues to be, an impressive group. Today, three months after convocation, 84 per cent of the class have found employment. These new graduates are working in major financial institutions and consulting firms including the Bank of Canada, BMO Financial Group, Central 1 Credit Union, CIBC, the CPP Investment Board, Deloitte, EY Canada, KPMG, Manulife Financial, Ontario Teachers' Pension Plan, PwC, RBC, Scotiabank Global Risk Management and TD Securities. “This class exceeded my expectations in every way,” says Susan Christoffersen, vice-dean of undergraduate and specialized programs. She is particularly impressed by how the MFRM ’17 students pushed themselves, supported each other and pursued opportunities outside the classroom. Last year, many students took the initiative to form teams and compete in case competitions. Notably, one team of MFRM students advanced to the international finals for the 2017 Professional Risk Managers’ International Association Risk Management Challenge (PRMIA) in London, UK. Hands-on learning Ensuring graduates were well trained and ready to enter the workplace was a key priority for faculty, and a driving force behind the two-month applied risk management project component of the program. For these projects, students stepped into the offices of major financial institutions to work on a real problem in risk. For Chang, who completed her project with the Canada Pension Plan Investment Board, it’s a crucial aspect of the MFRM experience. In addition to becoming strong risk analysts, MFRM students leave the program better writers and speakers. The program’s strong focus on business communications is what attracted many students, including recent graduate Sijing Tao (MFRM ’17). Throughout the program, many class presentations were filmed so that they could be reviewed with students in detail. And the School’s Self-Development Lab continually provides resources and workshops on networking and on delivering effective presentations. Tao, now a senior analyst with CIBC, believes that the communications skills and connections she acquired through Rotman contributed to her successful post-program job search.